As you can see by the standings, our Buccos are only a half game up on Houston. 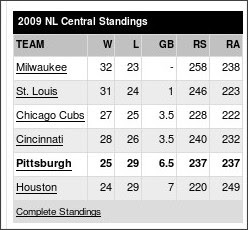 Tonight the Pirates can take over 6th place in the NL Central. Good pitching match-up. Paul Maholm vs Roy Oswalt. It's tough being a fan of the only MLB team that can finish 6th. That was a joke, and not a good one. Only about 3 people will be watching this game on TV and I won't be one of them. I don't think I have ever been this nervous before a Pens game. 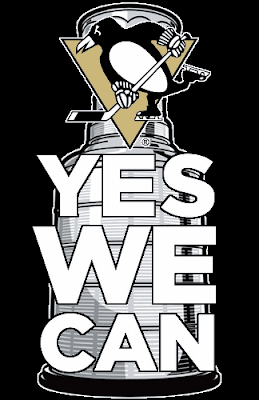 Pittsburgh has to win there once so how about tonight!!! If the Pens play anywhere near the way they did Thursday, I will be one drunk happy fucker. Datsyuk will be in the lineup for the Wings. Good. No way he's close to 100%. 70% at best. I'll take it. Malkin 100%. Crosby 100%. LETS GO PENS!